Today’s media has hijacked the word “radical.” Its Latin origin simply means “roots,” like the roots of a tree. In this sense, Christian parents actually hope to raise “radical” kids. As our kids grow up, we want them to grow down—deep into the roots of the faith. 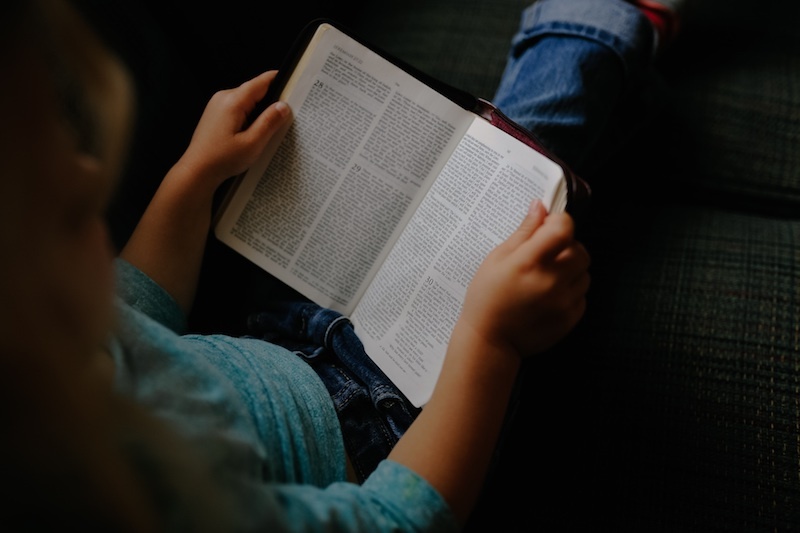 Why should we wait years to introduce our kids to theological treasures like the Trinity, the attributes of God, the storyline of the Bible, or union with Christ? Kids are brighter than we often realize. Even at a young age, they’re designed to absorb and interpret the world around them. As our kids grow up, we want them to grow down. Though off the mark, these answers show that children are always processing, ever journeying into the wider world around them. And it’s our job to guide them, pointing out truths they might miss or misinterpret on their own. We want them to come to know the Lord, the Word he has written, and the world he has made. This means that, as parents, we also must be learning, allowing the regular reading of God’s Word to shape us. We can avail ourselves of good books about Scripture or theology. And we can optimize our commute by listening to helpful podcasts or audiobooks. In all this, we can’t give out what we’ve not first taken in. Let’s sink our own roots down deep into the gospel—and then help our children do the same. Deep roots also make for strong trees. Radical strength is needed to withstand the winds of culture, which attempt to bend our children to their values. Yet if a tree has a good root system, it can withstand the wildest storms. Nurturing this kind of strength is difficult, but there are steps parents can take. First, your kids need to know you’re a sinner—and they need to know you know it too. If our instructions mainly sound like “You need to . . .You should have,” then we may be communicating something we don’t intend. In our best moments, we’re simply calling them to join us on the pathway of discipleship. “Follow me as I follow Christ” (1 Cor. 11:1). Let’s sink our own roots down deep into the gospel—and then help our children do the same. We can’t give out what we’ve not taken in. Kids regularly need to hear some version of “we.” Their ears should echo with our admission: “I sin like that too, and have to turn to Christ in repentance and faith.” For example, talk to your kids about how you deal with anger and the idols it unmasks in your life. Model for them what it looks like to forgive and ask for forgiveness. From your weakness, God will grow their strength. Second, your kids will find strength as they discover the goodness and faithfulness of God in creation and in history. As children and teens grow, they sometimes wonder if what they’ve been taught is real—or just some quirky view held by their family and a few others. Can Christianity navigate the swift currents of real life, or must it stick to some shallow, backwater tributary to stay afloat? It’s imperative to anchor our kids’ (and our own) view of God in the created world and the historical record. Sin divides—people from God, from each other, and from the goodness of the created order. In the great drama of redemption, God is uniting all things in Christ. And so as parents, we too must seek to connect what sin has divided. Practically, this might mean we help the next generation make the connection between the goodness of God and the wonders of science, the vigor of athletics, the joys of language. Do we help our kids take in sunsets, stories, snacks, and sleep—and give thanks to the Maker of such gifts? Helping them link gifts with the Giver will expose the prevalent lie that Christianity is an optional feature on real life. Christ isn’t just part of life; he “is your life” (Col. 3:4). Men and women have lived like this throughout history. We don’t stand alone in our faith. There’s parental wisdom in trying to protect our children from degraded aspects of the prevailing culture, but let’s not so isolate our families in a Christian subculture that they barely recognize our Christian heritage. The names of strong and diverse—yet flawed—men and women like Martin Luther, Sarah Edwards, John Bunyan, and Amy Carmichael should become familiar in our families. God-given, radical strength is nothing new. Is it easy to raise radical kids? Hardly. Glimpsing radical depth and radical strength in our children may seem miles and years away. But every day we have opportunities to plant seeds. At the simplest level, we should scatter conversations about God throughout our family routines. After all, as parents we’re the primary disciplers God has provided for our kids. As Paul observed, “I planted . . . but God gave the growth” (1 Cor. 3:6). So we must talk, talk, talk, and pray, pray, pray. As parents, we won’t be able to teach our children everything we want or everything they need. But we can plant seeds, which we pray God will cause to grow into strong trees with deep roots. Champ Thornton is associate pastor at Ogletown Baptist Church in Delaware. He has pastored in South Carolina and served as director of SOMA, a ministry training school in Columbus, Ohio. He is author of The Radical Book for Kids: Exploring the Roots and Shoots of Faith (New Growth Press, 2016). Champ and his wife, Robben, have been married since 1996 and have three children.